In our daily life, we have to deal with all kinds of information and data. For example, we need to deal with data like names, money, phone number, addresses, date, stock quotes and more. Similarly, in Visual Basic 2019, we have to deal with all sorts of data, some of them can be mathematically calculated while some are in the form of text or other non-numeric forms. 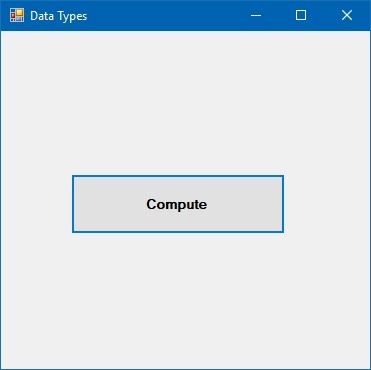 In Visual Basic 2019, data can be stored as variables, constants or arrays. The values of data stored as variables always change, just like the contents of a mailbox or the storage bin while the value of a constant remains the same throughout. Literals are values that you assign to data. In some cases, we need to add a suffix behind a literal so that Visual Basic 2019 can handle the calculations more accurately. For example, we can use num=1.3089! for a single precision data type, num=1.3089# for a double precision data type, num=130890& to indicate long integer data type and num=1.3089@ to indicate currency data type. The suffixes are summarized in Table 8.3. When VB2019 performs operation using arithmeric operators, it need to understand the data types. It can perform mathematical operations on data of numeric nature but not a mix of numeric data and non-numeric data. For example, we can add two numbers but not a number and a text or phrase. Let's examine the following examples. Start a project and add a button to the default form, name the button as BtnCompute and change its text to Compute, as shown in Figure 8.1. Running the program and click on the Compute button produces output as shown in Figure 8.4, because the plus operator does not add the strings, but concatenates them.